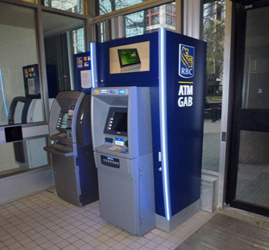 Bank Vault, Vault Doors, Bank Safes in Calgary, Edmonton, Toronto, and Vancouver - Wingenback Inc.
Wingenback started installing Automated Teller Machines (ATMs) in 1978 and grew to become one of the most trusted installers of ATMs across Canada. Wingenback is also established expert in surround design and development in North America as well as overseas. Our experienced project managers are ready to see your ATM project through - no matter how big or small - from your initial ideas to finished product. With our one-stop capabilities, we can assist you with: product conception, engineering, manufacturing, installation, construction/renovations, and project management. Our thorough follow-up practice after ever project is completed is a standard part of our consistent customer centric approach. design and engineer your products. build prototypes to bring your idea to reality. ship to anywhere local or international. handle your construction needs with our in-house carpenters. install your bank machines and surrounds. "We were successful with the integration of TD Canada Trust and the re-brand of TD Waterhouse due to Wingenback's commitment to excellence." Wingenback was there when Automated Self Delivery services was in its infancy and our company evolved along with the brand new industry. It's no surprise that three decades later, Wingenback is one of the leading providers of custom ATM, Self-Delivery retail solutions, products and accessories in North America We understand that your Self Delivery and ATM project is your face to the customer and it has to be just right. Let Wingenback put our quality design, materials, craftsmanship and experience to work for you. From day one until completion, Wingenback's Project Management team will make sure your project goes smoothly. We specialize in multi-site retail environments; financial institutions, petroleum retailers, and mass-merchandisers. Whether you're renovating, constructing or re-branding, Wingenback's in-house project management capabilities will partner with skilled trades people to undertake any size project. 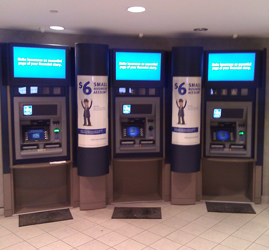 Wingenback products are built to last and designed to maximize your branding efforts for your ATM. Our surrounds are constructed with function in mind and add character to your facility as well as promote your all-important brand image. Whether you're renovating your space in a major city or building out a new one in a remote location, Wingenback will make sure your construction job is done right. We provide top notch construction and renovation services to companies all across Canada. Whether completing small or mid-size construction projects (including finishing, design and fabrication services), we have built a strong network of reputable companies and trades people to call on so that the job will be done right. Let Wingenback deal with permits, drawings and tenants so you don't have to. Wingenback has the right expertise, the right team and the right price for new and pre-owned security equipment and locksmith services. We can work with you to help identify your needs and then together we select the right solution from the wide array of security options we offer including vault and safe combination locks, digital and spin combination locks, vault doors, under the counter and Anti-Hold up cabinets, interior and exterior building door locks, vault lockers and safe deposit boxes. Wingenback has a long history of assisting with branch relocations that include moving night depositories, merchandising items, office equipment and the delicate matters of safety deposit boxes and vault contents. When it comes to the serious nature of Safe and Vault Repair and Service you need a name you can trust. Since 1975, Wingenback has been at the forefront when Banks and Retailers require the security of knowing that their cash security concerns will be met with the utmost skill, and reliability, 24 hours a day, 7 days a week, 365 days a year.